The outdoor furniture on your patio area is the first glimpse of your restaurant a customer gets when casually passing by. The atmosphere that you’ve worked so hard to create in your restaurant or bar should also translate to that glimpse. It could be the deciding factor of whether a customer decides to give your establishment a try. So if your patio leaves something to be desired, check out our End of Summer sale! 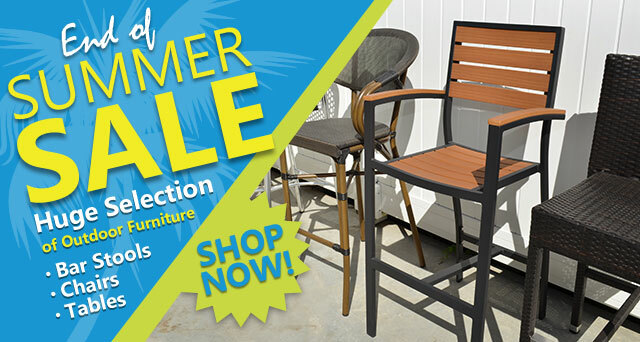 We’ve put your favorite outdoor furniture items on sale at our biggest discounts yet! If you’re looking to furnish your restaurant or bar’s outdoor area, now is the time to buy. The beginning of fall is the perfect season to upgrade the outdoor space you already have and be ready for the new year. Enjoy products from our Atlantic, New England (pictured below), Sydney, Cayman, Shipyard, and many more collections at prices you won’t see anywhere else in the industry. Whether you’re improving your patio layout or buying outdoor furniture for the first time, you can’t beat these high quality pieces at clearance rates. Choose from a wide selection of table tops, bar stools, and chairs. All sale items are only available for a limited time while in-stock. They won’t last long, so act now to make your restaurant dreams a reality with this summer sale.